Governors’ Ridge is the ridge connecting Plunket Dome, Islington and Liverpool and is the edge of the upper Dart Névé. Access to a fantastic alpine wander can be had by travelling up Cascade Saddle along Governors’ Ridge and down one of the ridges above Rough Creek. From the top of the track follow around and through a basin to Cascade Saddle. 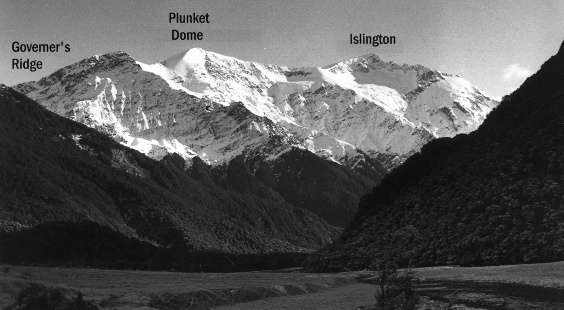 North of the saddle Governors’ Ridge, an easy, broad, but crevassed snow ridge leads over Plunket Dome and Islington to Liverpool. From Aspiring Hut to Liverpool requires about 7 hours. Governors’ Ridge was first climbed by Frank Wright, J R Simpson, Jack Clarke, Colin Ferrier & Bernard Head, Feb 1914. From Aspiring Hut cross Cascade Creek (bridged) and strike up through the bush from the top of the flats opposite the hut, to meet Rough Creek at the foot of the hill slope. Cross Rough Creek on avalanche ice to gain the scrubby ridge to the north. The ridge joins Governors’ Ridge between Plunket Dome and Islington. The main obstacle is usually a large schrund a short distance below Governors’ Ridge. The first ascent party took five and a half hours to reach Governors’ Ridge from a bivvy well above the bushline. It seems likely that this time could be improved considerably in good conditions and a time of six hours from Aspiring Hut to the ridge seems reasonable. Roland Rodda, Rod Sinclair, Leo Quinn & Ralph Glasson, Dec 1939. From Rough Creek (Route 3.2) climb through the bush and scrub of the ridge immediately south of the creek. Traverse left (south) across scree about 50m above the scrub line into a gully. Cross the creek in the gully and work up through the snowgrass bluffs to the south to reach a ridge with a clear gully on either side. Climb straight up the ridge until it peters out level with the snout of a small glacier descending from Plunket Dome. An easy traverse leads across to the glacier, the south side of which is then followed up to Governors’ Ridge, about 350m above Cascade Saddle. This route would probably take about five hours to Governors’ Ridge. It was investigated in 1954 as a possible alternative route to the Dart, and remnants of a cut track may be found below the bushline.